I have been building and painting model locomotives and rolling stock for more than 30 years and became a professional modeller in the late 1990's. Railways and model railways have been a part of my life since my schooldays and even whilst playing professional golf in my 20's I still carried on modelling in my spare time. My main interest was in O gauge finescale and having built a few models to a fairly high standard I was asked by Tower Models of Blackpool if I would build and paint models ordered by their customers. This I did for a couple of years until firstly the Bachman Brass range and then the Tower Brass range of ready to run models where introduced. These fine models came fully constructed in unpainted brass so that suddenly there were lots of people requiring them finishing. The amount of painting commissions coming from Tower Models was substantial so I decided that I should become a full time painter. In more recent years these models have been supplied in a factory paint finish that is not upto the standard of the rest of the model. Treating the factory paint finish as no more than a primer I have devised a method of repainting them into a more authentic state. I have painted so many of these models I have lost count but they number well into the thousands. A recent blog I started on the forum of the Gauge O Guild website where I wrote short messages on how I do things and also posted pictures of paint jobs created a lot of interest from other members. Many have asked me to paint their models. I have also been asked to demonstrate my skills at major model railway exhibitions all around the country. Painting and lining of kit built and ready to run models in 4mm, 7mm and 10mm scales. All painting commissions are fully researched to give a fully authentic livery for the period modelled. Wherever possible I use high quality cellulose paint which gives a very smooth and hard wearing finish. All lining is carried out to the very highest standard using enamel paint applied through a bow pen. Hand painting of numbers and crests if there are no available transfers. All models are finished with a protective lacquer coat to give a silky satin finish. If your preference is a high gloss or a dull finish then this is also achievable. Weathering from a day out of works right upto filthy and rundown. It is important that all models have a great finish, this can make or break it. At Leamington we require the best as we need to work with the painter to get things right. Warren is as dedicated as us in that. Pete Waterman OBE DL Leamington Spa. Warren’s work first came to my attention through the GOG Forum, and it was immediately clear that his painting and lining was of the highest standard. Some years on, incredibly, his work continues to reach even greater heights. He has now painted a number of engines I have built, and his skills really bring a model to life. 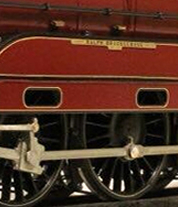 His research and knowledge of livery types and colours is second to none, and he provides a courteous and sympathetic service to many grateful and admiring modeller. Follow me on social media to keep up to date with my latest news easily. Feel Free to contact me anytime via email or phone.